From left, Discovery Center students Calvin Smith, Crosley Stewart and Leonnah Line play in the Shaving Cream Ice Skating rink with volunteers. Little ones are slip, sliding and learning at Discovery Center. It is the annual Shaving Cream Ice Skating activity for Head Start and preschool students. School officials say they’ve been staging this winter event for longer than they can remember, at least 24 years. The way it works is they cover half of the Discovery Center gym floor in a tarp. Then students and teachers spray shaving cream and water all around for a messy good time. 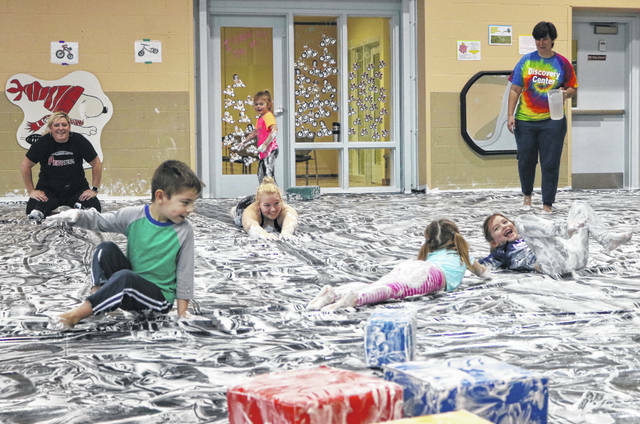 In addition, Discovery Center enlists community volunteers including parents, service clubs and local high school students to help slide the children down the gym, spin in circles and dance in the shaving cream. Students bring or borrow clothes that can get wet. Sulich says most kids dive right in, while others take a few minutes to get used to the feel. Nearly everyone ends up burning off some pent up energy. “Above all, it’s just fun for all the kids,” Sulich says.